I’ve put this post off for the longest time. There was a huge buzz surrounding the Alex Steinherr (creative and long time Beauty Director) X Primark skincare collab when it first launched! My main issue with the line and what was putting me off talking about it for so long…for one it’s not stocked in every Primark (Penneys in Ireland) and two, it’s literally only just (after six months or so of being out) been properly restocked! This stuff has been seriously hard to track down! When I have actually been in a store that sells it (check out the Global local stockist list here) the stand has been pretty much ransacked or if not they’ve been out of stock of any of the products I had any kind of interest in…until now! So now we’ve got that product rundown out of the way (although hopefully helpful if you’re unsure what you want to pick up) let’s get to the bits I picked up and have been trying! 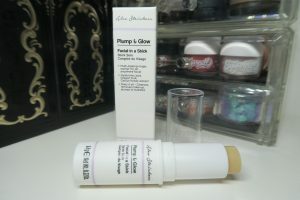 I’m going to start with the thing I’m not 100% sold on, but probably was the most intrigued about…the Plump & Glow Facial In A Stick. It’s multi-tasking, you can use the stick in 2 ways…emulsified with water and used as a makeup remover or as a regenerating, hydrating mask balm if applied straight from the stick and left on. Although fragrance free it does almost have a waxy kind of essence to it (and does contain waxes) which was a bit off putting for me, especially as my skin is combo and can be prone to blocked pores and sensitive to over hydration. I do like how it’s in stick form, super portable dead handy, but I do feel like this would be better suited to someone with really dry skin/ dry skin patches.The balm itself is very firm although does soften up a bit with the contact/ heat of your skin. I thought it might work well on the lips…it doesn’t as much as some of my favourite lip products and doesn’t taste great either, so a no on that from me. In terms of makeup removal…it works, pretty well actually (and again is in portable stick form, so compact and potentially great for travel) but is a little messy and I felt like I needed to cleanse again after this as it did (even when emulsified) leave a slight film on my skin. I do really like the feel of this on my forehead (which can get super dehydrated!) and like it best used as a prep for my moisturiser. I’ll keep having a play with the Facial In A Stick but yeah, underwhelmed. I think this is mainly due to my skin type not being the target skin type for this particular product though. If you love this or have any tips by the way…let me know!! On to the positives and really positive actually. 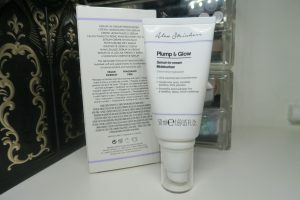 As well as the stick I also picked up the Plump & Glow Moisturiser from the same Plump & Glow range and the Every Night Eye Mask from the Sleep Spa range which was probably the thing I was most excited to try! 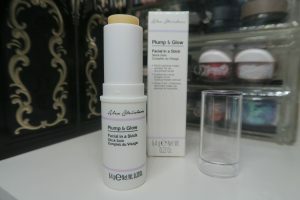 I picked up the Plump & Glow Moisturiser because I liked the sound of it, the ingredients and needed a light, every day product that I could throw on when I couldn’t be bothered with the whole serum, moisturiser routine. 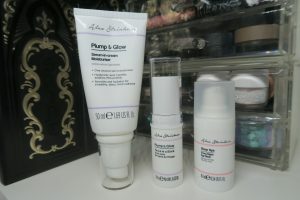 A quick fix product, which with the ‘serum in cream, 1 second skin transformer’ claim I had high hopes for. I really like this product! It’s not hugely innovative, but it does what it says on the tin. It contains hyaluronic acid which is an ingredient I generally look for in skin products, applies nicely, absorbs well…it does leave your skin smooth, hydrated and although I wouldn’t say particularly dewy…it does give your skin a healthy plumped up look and feel. I’d definitely buy this one again. Last but definitely not least…the Sleep Spa Every Night Eye Mask…I LOVE this! Absolutely the hero Alex X Primark product for me! My eye area is one of my most ‘problem’ areas. In the grand scheme of things my eye area skin is pretty sensitive but well behaved, it’s my under eye darkness that I’m always most concerned with when it comes to skincare and makeup. Yes I get sleep, yes I drink plenty of water…it’s a hereditary thing (thanks mum haha). So this is described as a reviving, soothing and energising eye infusion, helps depuff and wake up the eyes and it does! The Every Night Eye Mask is silicone based (I’d usually avoid a silicone based face primer, I just don’t like the feel or how my makeup sits over it, but in an eye product and especially this one it works!) cooling on application and smooths effortlessly in to your skin. I use a small amount of this (as with all eye creams…I love the ELF Illuminating Eye Cream durning the day) around the whole eye area…under my eyes, sides and right on to my brow bone in a patting motion. This has soothing ingredients (chamomile), hydrating sodium hyaluronate, anti-inflammatory silk tree extract and most excitingly antioxidant willowherb, which is not only anti-ageing but potentially reverse ageing too!! Restorative and healing eye treatment £4/ €5…yes please!! I’ve only been using it (every night) for the past few weeks so it’s too early to see any long term effects, but I’ve seen enough to know that I really like it and it improves both the texture/ appearance of my skin and how my makeup sits over the top. I’ll be bulk buying the Every Night Eye Mask, get it before I do! That brings me nicely on to the price point…everything in the Alex Steinherr X Primark skincare collab range is £5/ €6 and under. Premium skincare and effective ingredients at an affordable price point, Something for every skin type and concern. Cruelty free, Vegan, fragrance free and free of nasties…if you’re yet to try anything and are anywhere near a Primark/ Penneys that sells it, it’s well worth giving something a go at those prices. If only it was sold online! Alex Steinherr X Primark Skincare collab is available in store in selected Primark/ Penneys stores now. Have you tried anything? What will you pick up?